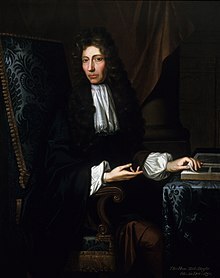 Robert Boyle FRS (25 Januar 1627 – 31 December 1691) wis an Anglo-Erse naitural filosofer, chemist, pheesiceest an inventor born in Lismore, Coonty Waterford, Ireland. ↑ 1.0 1.1 "Fellows of the Royal Society". London: Royal Society. Archived frae the oreeginal on 2015-03-16. ↑ John J. O'Brien, "Samuel Hartlib's Influence on Robert Boyle's Scientific Development." Annals of Science, Volume 21, Issue 4, 1965. ↑ Deem, Rich (2005). "The Religious Affiliation of Robert Boyle the father of modern chemistry. From: Famous Scientists Who Believed in God". adherents.com. Retrieved 17 April 2009. This page wis last eeditit on 17 Mey 2018, at 21:50.